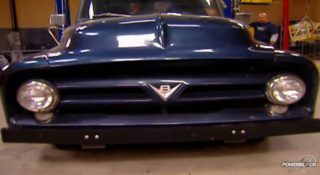 E-Force Supercharger Install : Trucks! Trucks! installs a supercharger on a 5.3 liter GMC. 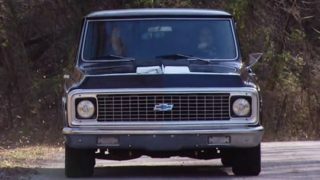 (ANNOUNCER)>> TODAY WE'RE ADDING EDELBROCK'S EFORCE SUPERCHARGER TO A FIVE POINT THREE LITER GMC WITH A LITTLE HELP FROM THE GUYS AT LINGENFELTER. 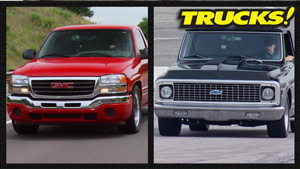 WE'LL SHOW YOU HOW TO MAKE WAY MORE HORSEPOWER FOR TOWING, OR FOR JUST HAVING A LITTLE MORE FUN! IT'S ALL TODAY HERE ON TRUCKS. (KEVIN)>> HEY GUYS, WELCOME TO TRUCKS. CHECK OUT WHAT WE'VE GOT IN THE SHOP TODAY. 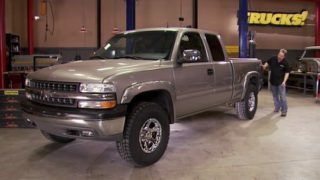 THIS IS A 2011 GMC SIERRA 1,500 FOUR WHEEL DRIVE PICK UP. 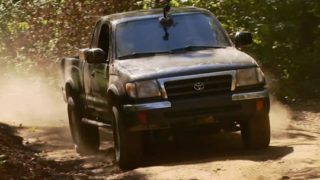 AND LIKE A LOT OF THESE TRUCKS, THIS ONE'S BEEN TWEAKED A LITTLE BIT WITH A SIX INCH LIFT, MICKEY THOMPSON WHEELS, AND SOME PRETTY AGGRESSIVE MUD TERRAIN RUBBER. 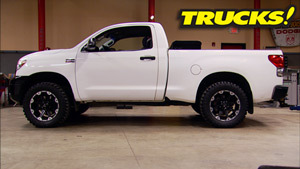 NOW IN STOCK TRIM THE FIVETHREE LS UNDER THE HOOD, WHICH HAS PROVEN ITSELF TO BE ROCK SOLID, IS MORE THAN ENOUGH TO MOTIVATE THIS TRUCK DOWN THE ROAD UNDER NORMAL DRIVING CONDITIONS. BUT YOU THROW SOME EXTRA PARASITIC WEIGHT AT IT, HEAVIER ROLLING STOCK, AND IT LEAVES YOU WANTING JUST A LITTLE BIT MORE. 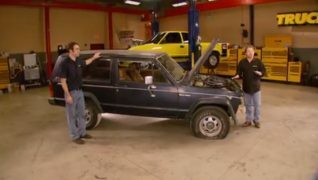 SO TODAY'S SHOW WE'RE GONNA SHOW YOU HOW TO GET THAT BACK, EXCEPT NOT JUST A LITTLE BIT MORE, A LOT MORE, CHECK THIS OUT. AND AIR FILTER. HECK IT EVEN COMES WITH ITS OWN CALIBRATION MODULE SO YOU CAN GET THIS THING TUNED, DIALED IN RIGHT OUT OF THE BOX, AND TAKE IT FOR A TEST SPIN AS SOON AS YOU'RE DONE. NOW BEFORE WE GET STARTED ON THE INSTALLATION, WELL WE WANT TO GET OUR LIFTED TRUCK SITTING A LITTLE BIT LOWER SO WE CAN ACTUALLY WORK ON THE THING. (KEVIN)>> WELL NOW THAT WE'VE GOT THE WHEELS OFF AND THE TRUCK DOWN ON JACK STANDS AND THE HOOD REMOVED FOR WAY BETTER ACCESS, WE'RE READY TO GO TO WORK. AND EVEN THOUGH WE'RE GONNA WALK YOU THROUGH THIS PROCESS STEP BY STEP, IF YOU FIND YOURSELF EITHER WITH NOT ENOUGH TIME OR A LITTLE BIT NERVOUS ABOUT YOUR SKILLS IN TACKLING A PROJECT LIKE THIS, ANOTHER GREAT OPTION FOR YOU IS TO FIND AN AUTHORIZED EDELBROCK INSTALLER. NOW ONE OF THE MORE POPULAR ONES AND CERTAINLY ONE YOU'VE SEEN HERE ON POWERBLOCK IS LINGENFELTER PERFORMANCE ENGINEERING. (MIKE)>> WHEN YOU BRING YOUR VEHICLE TO LINGENFELTER, ALL WORK IS DONE BY OUR CERTIFIED TECHNICIANS IN HOUSE. WE KEEP THE EDELBROCK SUPERCHARGERS IN STOCK. YOU JUST DROP YOUR VEHICLE OFF AND PICK IT UP DONE. ONE THE BEST PARTS IS WHEN IT ARRIVES, WE'LL DYNO TEST IT, VERIFY THE POWER, AND THEN WE'LL DYNO TEST IT AT THE END TO SHOW YOU HOW MUCH IMPROVEMENT YOU GOT. (KEVIN)>> NOW MIKE'S NOT JUST A SUIT OVER AT LINGENFELTER. 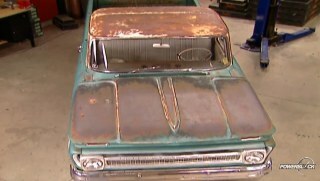 HE'S GOT DIRT UNDER HIS FINGERNAILS AND A LONG HISTORY OF HOT RODDING. AND HE'S HERE TO HELP US INSTALL THE KIT, GIVE YOU GUYS SOME POINTERS, AND DISCUSS SOME INSTALLATION OPTIONS. SO WHAT'S NEXT? (MIKE)>> WE'RE GOING TO PUT THIS IN, LET'S DO IT. A SUPERCHARGER IS UPDATE THE PROGRAMMING IN THE ENGINE CONTROLLER. EDELBROCK SUPPLIES THIS UNIT THAT YOU PLUG IN UNDER THE DASH TO DO IT. NOW YOU CAN DO IT BEFORE YOU TEAR THE VEHICLE APART OR YOU CAN DO IT AFTER YOU'VE INSTALLED THE SUPERCHARGER. WE RECOMMEND THAT YOU DO IT BEFORE HAND. THE FACTORY COULD HAVE MADE CHANGES TO YOUR SPECIFIC VEHICLE IN THE PROGRAM THAT WON'T LET IT MATCH WITH THE EDELBROCK CONTROLLER. EDELBROCK GIVES YOU THE OPPORTUNITY, SHOULD YOU HAVE THAT HAPPEN, TO RECORD A NUMBER AND SEND IT BACK TO THEM. THEY'LL UPDATE THE PROGRAMMER TO MEET YOUR EXACT REQUIREMENTS AND SEND IT BACK TO YOU. NOTHING LIKE FINDING THAT THE FIRST DAY INSTEAD OF THE LAST. 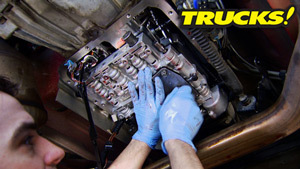 (RYAN)>> NOW THE FIRST MAJOR STEP IN THE INSTALLATION IS REMOVING THE FACTORY INTAKE MANIFOLD. (RYAN)>> ALRIGHT, WITH THE INTAKE MANIFOLD, ALTERNATOR, AND BRACKET REMOVED, WE'RE JUST ABOUT READY TO START THE ACTUAL INSTALLATION. NOW WE'VE ALSO REMOVED THE FACTORY VALLEY TRAY BECAUSE THE ACTIVE FUEL MANAGEMENT SYSTEM OR SOLENOID PACK GETS REMOVED BECAUSE THE GASKET UNDERNEATH IT NEEDS TO BE MODIFIED AND REUSED. (KEVIN)>> THE AFM OR DISPLACEMENT ON DEMAND GETS REMOVED BY CUTTING THE FACTORY RIVETS. THIS GASKET GETS MODIFIED BY GRINDING DOWN THE LOCATION TABS FLUSH TO THE SURFACE AND BY DRILLING SEVERAL OIL DRAIN BACK HOLES THAT'LL REDIRECT THE OIL BACK DOWN INTO THE BLOCK. (RYAN)>> ALRIGHT, NOW WE'VE GOT OUR ORIGINAL GASKET MODIFIED AND READY FOR INSTALLATION ALONG WITH OUR SUPPLIED VALLEY TRAY. NOW DEPENDING ON THE MODEL OF VEHICLE YOU HAVE, YOU MAY NOT EVEN HAVE ACTIVE FUEL MANAGEMENT. IF YOU DON'T, YOU OBVIOUSLY DON'T HAVE A GASKET TO MODIFY. A FEW THREADS BECAUSE BEFORE WE TORQUE THEM DOWN, WE'RE GONNA APPLY A LITTLE BIT OF LOCTITE ANTISEIZE BECAUSE THAT WILL PREVENT FRICTION IN BETWEEN THE BOLT HEAD AND IT'S MATING SURFACE BECAUSE THAT CAN EFFECT THE TORQUE SPEC WHILE YOU'RE TIGHTENING THE BOLTS DOWN. (MIKE)>> WHEN INSTALLING THE LIFTER VALLEY COVER, IT'S CRITICAL THAT YOU FOLLOW THE TORQUE PATTERN AND THE TORQUE SEQUENCE. THESE BOLTS TORQUE TO 18 FOOT POUNDS. FAILURE TO DO THAT COULD RESULT IN BLOCK DISTORTION. (KEVIN)>> HEY WELCOME BACK TO TRUCKS AND OUR EDELBROCK EFORCE SUPERCHARGER INSTALLATION. NOW ACCORDING TO EDELBROCK, THE NEXT STEP IN THE INSTRUCTIONS IS TO REMOVE THE STARTER AND EXPOSE THE TEETH ON THE FLEX PLATE. WORK AND GETS THE JOB DONE. NOW WITH THE ACCESS PLUG OUT OF THE WAY YOU CAN SEE THE FLEX PLATE, AND WHAT THIS DOES IS LOCK THE CRANK SHAFT IN PLACE AND PREVENTS IT FROM ROTATING WHILE YOU'RE LOOSENING AND TIGHTENING THE HARMONIC BALANCER BOLT. NOW THE KIT INCLUDES A NEW BOLT AND REAMER GUIDE THAT GETS TEMPORARILY INSTALLED. THEY ALSO SUPPLY A NEW DRILL BIT THAT WE'VE MARKED WITH SOME YELLOW TAPE AT THE APPROPRIATE DEPTH. YOU DON'T WANT TO OVER DRILL. NOW THE HOLE WILL PROVIDE A LOCATION TO INSTALL A NEW DOWEL PIN PROVIDED IN THE KIT. (MIKE)>> THE SUPERCHARGER SIGNIFICANTLY INCREASES THE BELT LOAD ON THE DAMPENER. NOW SINCE IT'S NOT KEYED FROM THE FACTORY, INSTALLING THIS PIN WILL KEEP IT FROM SLIPPING ON THE CRANK SHAFT. (RYAN)>> THEN IT'S JUST A MATTER OF INSTALLING A NEW HARMONIC BALANCER BOLT. TIGHTENING THIS BALANCER BOLT WAS A TWO PART DEAL. THE FIRST PART WAS TIGHTENING IT TO 37 FOOT POUNDS. THEN WE'RE GOING TO TAKE IT 140 DEGREES SINCE IT'S A TORQUE TO YIELD BOLT. WE'RE STARTING AT ZERO AND I'M BRINGING IT AROUND TO 140 DEGREES ON THE DIAL. (MIKE)>> A TORQUE TO YIELD FASTENER IS DESIGNED TO STRETCH LIKE A SPRING, AND IT'S THE FORCE CREATED BY THAT STRETCH THAT MAINTAINS THE TORQUE. (RYAN)>> NEXT WE REMOVE THE ORIGINAL CROSS OVER TUBE AND REPLACE IT WITH ONE THAT'S SUPPLIED IN THE KIT. THE NEW PIECE RELOCATES ONE OF THE PORTS TO THE DRIVER'S SIDE AS TO NOT INTERFERE WITH THE NEW SUPERCHARGER. NOW INSTALLING THE NEW SUPERCHARGER MANIFOLD ASSEMBLY IS A TWO PERSON JOB. IT'S NOT EXTREMELY HEAVY, BUT IT IS A LITTLE BIT AWKWARD AND WELL, YOU JUST DON'T WANT TO DROP YOUR NEW INVESTMENT. 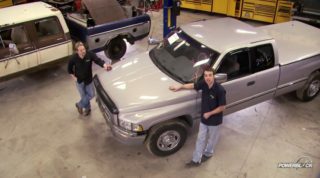 (KEVIN)>> HEY WELCOME BACK TO TRUCKS WHERE WE'RE ON THE HOME STRETCH WITH TODAY'S PROJECT, WHICH IS INSTALLING THE EDELBROCK EFORCE SUPERCHARGER ON THIS FIVETHREE LS THAT'S STUCK IN BETWEEN THE FRAME RAILS OF THIS 2011 GMC SIERRA. NOW HELPING TO SHOW YOU GUYS SOME OF THE FINER POINTS OF THIS INSTALLATION IS A REAL HOT RODDER, MIKE COPELAND. MIKE, WHAT'S NEXT? (MIKE)>> WELL WE'RE JUST FINISHING TORQUING THE SUPERCHARGER DOWN, GETTING READY TO BUILD SOME FUEL RAILS HERE, INSTALLING THE NEW INJECTORS THAT EDELBROCK SUPPLIED, THEN WE'LL GO ON AND FINISH A COUPLE OF THINGS. WE'RE GONNA MAKE SOME NOISE HERE PRETTY SOON. (KEVIN)>> THE NEW FUEL RAILS, ALONG WITH THE NEW SUPPLIED FUEL INJECTORS, GET POPPED INTO PLACE AND CONNECTED WITH THE FACTORY HARNESS CONNECTIONS AND LOCKS. THE FAMOUSLY UGLY LS COIL PACKS GO BACK ON THE FACTORY COVERS. (RYAN)>> NOW THE SUPPLIED HEAT EXCHANGER GETS INSTALLED RIGHT BEHIND AND BELOW THE FACTORY HOOD LATCH SUPPORT. IT'S A GOOD SAFE LOCATION AND IT WILL RECEIVE PLENTY OF AIR FLOW. (KEVIN)>> THE SUPERCHARGER HAS AN INDEPENDENT COOLING SYSTEM WITH ITS OWN RESERVOIR, WHICH GETS BOLTED IN PLACE USING TWO STUDS ON THE COIL PACK BRACKET. SAME STYLE BOSCH PUMP THAT'S VERY COMMON TO MOST FACTORY SUPERCHARGED APPLICATIONS IS USED IN THIS ONE AS WELL. IT'S TUCKED SAFELY OUT OF THE WAY BEHIND THE BUMPER ON THE RIGHT HAND SIDE. 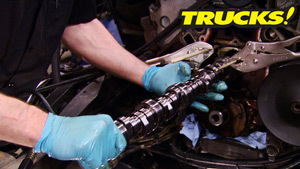 THE SUPPLIED COOLANT ROUTING HOSES GET DROPPED INTO PLACE, AND FOLLOWING THE INSTRUCTIONS ARE EASILY CONNECTED, MAKING THIS A PLUG AND PLAY SYSTEM WITH NO TRIPS TO THE PARTS STORE. (RYAN)>> THE PAPER AIR FILTER GETS TOSSED IN THE TRASH AND REPLACED WITH THIS GREEN HIGH FLOW AIR FILTER. THEN IT'S SIMPLY A MATTER OF REINSTALLING THE FACTORY THROTTLE BODY WITH SUPPLIED NEW HARDWARE. ADD TO THAT THIS NEW AIR BOOT, TIGHTEN IT DOWN, AND MAKE YOUR NEW ELECTRICAL CONNECTIONS AT BOTH THE THROTTLE BODY AND THE MASS AIR FLOW METER AND YOU CAN CALL THE AIR INTAKE PORTION DONE. THEN YOU CAN MOVE ON TO THE INTERCOOLER PLUMBING BY ATTACHING THESE FACTORY STYLE ENDS. THEN REINSTALL THE FACTORY ALTERNATOR BRACKET ALONG WITH THE SUPPLIED ALTERNATOR RELOCATION BRACKET. AFTER INSTALLING A GROMMET INTO THE BRACKET, ROUTE THE HOSE THROUGH THE BRACKET AND ATTACH IT TO THE BOOST BYPASS VALVE. SUPPLIED ALTERNATOR RELOCATION BRACKET. FOLLOW THAT BY INSTALLING THE ORIGINAL ALTERNATOR. THEN REROUTE THE 12 FOOT LONG SERPENTINE BELT. THEN IT'S TIME TO FILL AND TOP OFF FLUIDS. (KEVIN)>> GOOD OIL PRESSURE, NO CHECK ENGINE LIGHT! (KEVIN)>> WHAT'S THAT WHISTLING SOUND, IS THERE A VACUUM LEAK! (RYAN)>> IT'S THE SOUND OF POWER. NICE, NICE WORK! (RYAN)>> HEY GUYS, WELCOME BACK TO TRUCKS, WHERE WE JUST FINISHED UP OUR EDELBROCK EFORCE SUPERCHARGER INSTALL ON THIS 2011 GMC. NOW SINCE WE'VE ADDED A SUBSTANTIAL AMOUNT OF GO TO THIS TRUCK, WELL WE THOUGHT IT'D BE A WISE MOVE TO ADD A LITTLE BIT OF WHOA AS WELL. AND THAT'S EXACTLY WHAT WE'RE DOING IN THE FORM OF THESE EBC SLOTTED SPORT ROTORS AND GREEN STUFF PADS. (KEVIN)>> NOW LIKE WE ALWAYS DO, WE'VE SHOWN YOU THE STEPS INVOLVED IN INSTALLING YOUR OWN EDELBROCK EFORCE SUPERCHARGER, AND WE'VE ALSO HAD SOME SKILLED HANDS HERE HELPING US DO IT WITH MIKE COPELAND FROM LINGENFELTER. BUT HE'S NOT JUST HERE DOING US A FAVOR TURNING WRENCHES. LINGENFELTER PERFORMANCE ENGINEERING CAN ALSO HELP YOU GUYS OUT. AND GET TO OPERATE PROPERLY. FOR PEOPLE THAT DON'T FEEL COMFORTABLE DOING THAT, CONTACT LINGENFELTER PERFORMANCE ENGINEERING, WE'LL SCHEDULE AN INSTALL APPOINTMENT, SUPPLY YOU WITH A SUPERCHARGER, AND MAKE THE COMPLETE PACKAGE WORK SO YOU JUST PICK IT UP DONE. SO SPEAKING OF DONE, HOW ABOUT WE GO TEST THIS ONE. (MIKE)>> PULLS PRETTY HARD UP THERE DON'T IT? (KEVIN)>> THAT'S PRETTY GOOD. THERE'S NO QUESTION THIS IS A BIG HEAVY TRUCK WITH BIG HEAVY WHEELS, BUT WITH THE NEW SUPERCHARGER YOU CAN REALLY FEEL A DIFFERENCE, ESPECIALLY IN THE MID RANGE TORQUE. ACCELERATION ACROSS THE BOARD IS MUCH IMPROVED, AND QUITE FRANKLY THIS THING NEEDED A SUPERCHARGER. 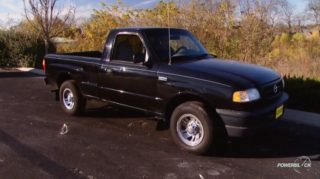 (RYAN)>> NOW THE TOWING CAPACITY OF HALF TON TRUCKS HAS DRASTICALLY INCREASED IN COMPARISONS TO TRUCKS THAT ARE 15 OR 20 YEARS OLD, AND THIS ONE WAS NO SLOUCH EVEN WITH THE 342 GEARS THAT ARE IN THE REAR AXLE THAT CAME FROM THE TRUCK FROM THE FACTORY. NOW 342 GEARS ARE DEFINITELY NOT A TOWING GEAR, AND THIS TRUCK COULD CERTAINLY USE SOME 411'S OR EVEN 456'S TO MATCH THE 37 INCH TALL TIRES. BUT IT REALLY DIDN'T HAVE ANY PROBLEM HAULING OUR 24 FOOT ENCLOSED TRAILER DOWN THE ROAD AT HIGHWAY SPEED. 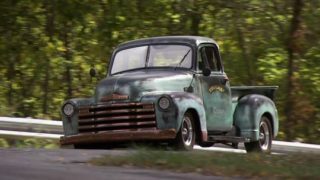 NOW WITHOUT THE SUPERCHARGER OR THE TRAILER, WELL THIS TRUCK WAS STILL HUNTING FOR GEARS ALL THE TIME. BUT NOW THAT'S NOT AN ISSUE. A STOCK ENGINE, IT REALLY ACTUALLY INCREASES THE EFFICIENCY OF THE WHOLE PACKAGE. WELL IT INCREASES THE EFFICIENCY AND ECONOMY UNTIL YOU PUT YOUR BIG GIANT RIGHT FOOT IN IT. STRUT SPACERS FOR THE FRONT OF THE TRUCK. 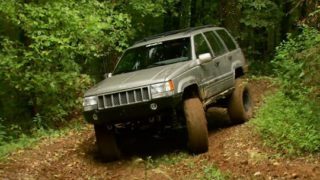 NOW ZONE OFF ROAD CLAIMS THAT YOU CAN CLEAR 33 INCH TIRES WITHOUT BREAKING THE BANK. IN FACT THIS KIT HAS AN MSRP OF ONLY $200 BUCKS. IF YOU'VE GOT A JEEP JK WRANGLER WITH THE THREE POINT EIGHT LITER VSIX AND YOU'D LIKE A LITTLE BUMP IN POWER AND YOU'D LIKE TO IMPROVE THE SOUND COMING OUT OF THE EXHAUST. 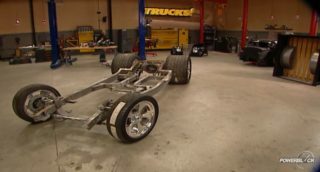 WELL YOU NEED TO CHECK OUT MAGNAFLOW'S AXLE BACK SYSTEM. NOW THIS TOUGH LOOKING MATTE BLACK FINISH IS OVER TOP OF 100 PERCENT STAINLESS STEEL. NOW THIS SYSTEM HAS BEEN DYNO TESTED AND PROVEN TO INCREASE HORSEPOWER AND TORQUE, AND WILL PROVIDE A DEEP MELLO TONE. 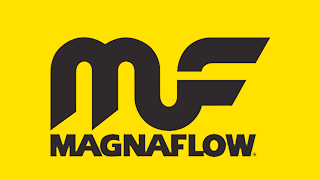 THIS MAGNAFLOW SYSTEM ALSO COMES WITH A LIFETIME GUARANTEE. SIMPLY REPLACING YOUR BATTERY CABLES, WELL CHECK OUT ACCEL'S LIGHTNING CABLE AND TERMINAL ENDS. GUYS, THANKS FOR WATCHING TRUCKS, SEE YOU NEXT WEEK.